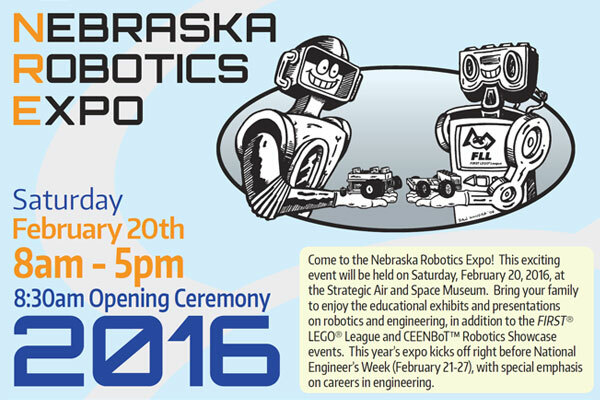 Nebraska Robotics Expo set for Feburary 20 at Strategic Air & Space Museum in Ashland. 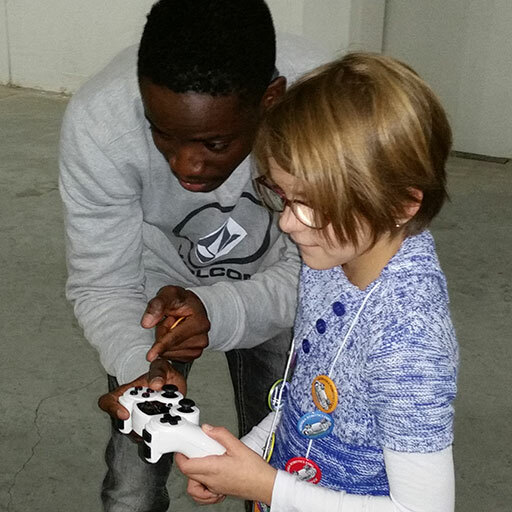 Daryl Dodoo, a junior computer engineering major, explains how to work the controls of a robot to 9-year-old Mia Vogel of Lincoln during the 2015 Nebraska Robotics Expo. Nearly 1,000 K-12 students, team leaders and math and science teachers form Nebraska will pack the Strategic Air & Space Museum in Ashland on Saturday, February 20 for the annual Nebraska Robotics Expo. Two robotics events will be featured under one roof – the CEENBoT Robotics Showcase and the FIRST LEGO League (FLL) – along with a Creative Visual Arts Expo. More than 90 teams from 26 Nebraska elementary, middle and high schools will take part, and there will be interactive activities for all visitors to partake in, such as CEENBoT tae kwon do, Minute to Win It, robot driving challenges and a bumpbot mode. Nebraska Lt. Governor Mike Foley will headline this year’s opening ceremonies, which will begin at 8:30 a.m. in the atrium. The event will conclude with the closing ceremonies, set for 4 p.m. The Nebraska Robotics Expo encourages student involvement with science, technology, engineering and math (STEM) as well as educates and engages a new generation of innovators, their families and the general public about STEM opportunities in Nebraska. Alisa Gilmore, associate professor of practice in electrical and computer engineering, is coordinator of the Nebraska Robotics Expo and CEENBoT Robotics Showcase. Many more faculty, staff and students from the University of Nebraska-Lincoln College of Engineering and the University of Nebraska Omaha College of Education are also instrumental in making the expo a success.